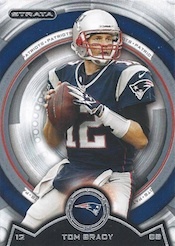 2013 Topps Strata Football is the followup to one of last year's most popular debuts. The box-hit acetate autographed rookie relics return, offering a variety of layered options. The challenge for this year's set is to show a little more variety. That said, the format remains largely unchanged. 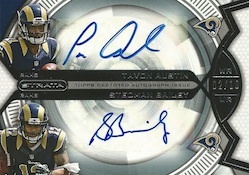 Each 2013 Topps Strata hobby box has three hits: one autographed relic, an autograph and a relic. The base set consists of 150 cards, 100 veterans and 50 rookie cards. Like last year, rookies have different photos in hobby and retail packs. Rookies have six different parallels, all of which are numbered: Bronze (#/150), Gold (#/99), Sapphire (#/50), Emerald (#/10), Ruby (1/1) and hobby-exclusive Printing Plates. The line's signature Clear Cut Autographed Relic Rookie cards return, falling one per box. The cards take a layered approach that has a large jersey piece one the bottom. These material pieces measure nearly 3" by 2". Over top of that is a clear front that has both the player's image and autograph. A window is left so the jersey swatch can be touched. Numbered parallels include Bronze (#/150), Gold (#/99), Sapphire (#/60), Emerald (#/30) and Ruby (#/15). Sapphire, Emerald and Ruby cards come with patch pieces and are only in hobby packs. Every hobby case has three patch parallels. Four different one-of-one Quartz parallels each offer different types of relics: Gloves, Pigskin, Swoosh and Patch. Strata Signature Relics return, once again as a hobby-exclusive case hit. These take the layered feel a step further, offering another massive relic piece and three total layers, one of which is signed. Rookies and veterans are included on the checklist. Parallels include Ruby Patch (#/15), Rivet Patch, which can be opened up to its various layers, and Rivet Swoosh (1/1). 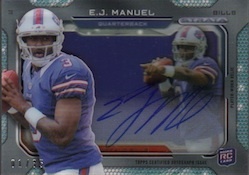 The product also has a handful of Clear Cut Dual Autograph Rookie Patch Book Cards that are numbered 1/1. Strata Autographs are inserted one per box. The cards use stickers but the checklist is primarily rookie-focused. Parallels come in six numbered levels, none higher than 150. Strata Relics also fall one per box. They also have six parallels, although all are only found in hobby packs. Each case has three patch parallels. 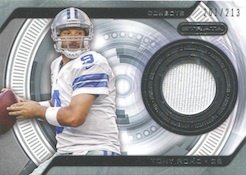 2013 Topps Strata Football has one basic insert set. Rookie Die-Cut cards are inserted one per box. The large checklist of more than 40 players makes it something of a challenge to build. Collectors can also look for special redemption cards good for uncut sheets of base cards, rookies, retail rookies and Rookie Die-Cut inserts. 150 cards, including 100 veterans and 50 rookies. Shop for base sets on eBay. Hobby and retail rookie cards use different photos. Click here to see them all. Good: Affordable product. Clear Cut Autographed Rookie Relics look great. Three hits per box. Bad: Thicker cards are very condition sensitive. Many were damaged in the box. Few inserts available. The Bottom Line: The Clear Cut Autographed Rookie Relics are the big draw of this product and it is hard to beat the price for three hits per box. While the card design has improved over last year, there are still some improvements that can be made in the packaging to reduce card damage. 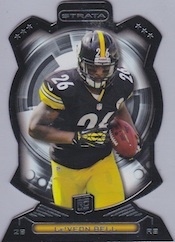 The updated base card design in 2013 Topps Strata Football is a great improvement over last year’s product. The cards are more colorful and you get the illusion that the player is actually coming through a portal. It really makes the player stand out more on the card. The Topaz Orange parallels are a nice addition. I like that Rookie Die-Cut cards feature a black border, with the team colors behind their nameplates. The downside to the intricate die-cut is that the cut appears to be off-center on many of them. The player worn memorabilia cards are hit and miss. I have seen some sweet multi-colored patches and some not so exciting single-jersey swatches. I would like to see more of the multi-color patches. On the plus side, when I pulled the base autograph, I actually thought it was an on-card auto because the sticker is well-placed and doesn't take away from the design. 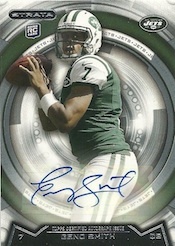 The main appeal of 2013 Topps Strata Football is the Clear Cut Autographed Rookie Relics. First of all, they are on-card autographs, and are actually signed on acetate. Add in a player-worn memorabilia swatch and that makes the card even more desirable. The parallel patch versions look amazing with the jumbo swatch attached. This has been one of my favorite new innovations in jersey autograph cards that have been developed in recent years. The base card set is comprised of 150 cards, which includes 50 rookies. While there are some veteran sticker autographs, this is definitely a rookie product. The Clear Cut Autographed Rookie Relics feature mostly players who attended the Rookie Premiere, but there are some additional players. I didn't really like that some packs would have no rookies at all, and others would have three or four. I would rather see at least one rookie card in every pack. This is also a very simple product, as the only base insert is the Rookie Die-Cut set. The only other true inserts are the various colored parallels. The box had a lot of duplicates and was missing many of the main rookies. It would probably take at least three boxes to build a set. 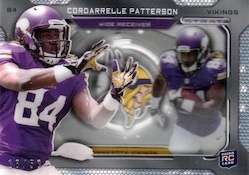 2013 Topps Strata Football boxes cost around $70, which makes it a very affordable product. The downside of this is that unless you pull an autograph of one of the top rookies, it will be hard to break even. The fact that the thicker card stock is prone to damage during packing will definitely hinder many collectors. This is a fun product to open. While this box lacked some of the top rookies, the chance to pull a Clear Cut Autographed Rookie Relics makes it worth the time. Also, unlike last year, it was not obvious which pack had the Clear Cut Autographed Rookie Relics, so collectors wont have to worry as much about pack searchers. It’s looking really good this year! Good mix. and photos Should be ok to build a set. Ripped one box and pulled Christine Michael signature relic Rivet card /5!!!! Great set overall. Purchased two cases after being out of the card world for over 10 years. If you’re looking for hits then this product is what you want. The only reason this product could be considered average is because they put a lot of the below average rookies. Out of two cases we pulled four Mike Gillislie autographed relics as well as four Knile Davis autographed relics. The cards are essentially worthless. I understand that not every box is going to yield an epic hit, but I can’t even come close to breaking even with stuff like that. But overall the cards are awesome and I really liked the product! pulled 2 printing plates out of 2 value boxes and they are hobby box exclusive…am i missing something? Inexpensive buy but terrible quality of hits IMO. Watching box breaks it is the SAME GUYS OVER AND OVER. 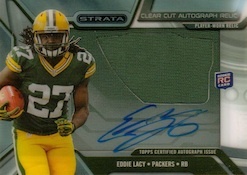 I have bought two boxes, hit Lacy #d/99 auto and should have called it quits then. Great price point for auto and auto relics. I hit a Geno Smith Rivet in a break and have been chasing others with terrible luck. I’ve done 3 strata breaks and have seen boxes with the same guy/team auto in the box. i.e a Kenny Stills patch auto and base auto in the same box 2x. Then 2 49ers in the same box.. Then 2 Terrance Williams auto’s. Great for buying boxes but terrible for team breaks. Have a question. Have you heard about I would believe are ERROR cards? I just got a box and I have something here I don’t know what? Like card #30 has Giovani Bernard on the front and Aaron rodgers stats on the back. That’s just ONE I have a stack like that, one player on the front and different player and stats on the back?? Let me know please. Thanks. Sounds like a printing mistake. Sometimes you can find player collectors who will pay a little for the novelty aspect but others send them back for replacements. Printing Plates are NOT hobby exclusive. Just picked up a 7 pack retail blaster that Walmart marked down to 11.99. Monster, Lattimore RC auto, and the last pack delivered some LOB Mojo. Richard Sherman yellow printing plate 1/1, right there in retail. Siiiick 12$ blaster lol. Love the hobby end too. I love Strata this year. In the last month I’ve bought 1 retail blaster, and 1 hobby box. Retail had Lattimore RC auto, and Richard Sherman PP Yellow. Hobby I just opened had Andre Ellington SSR shadowbox auto /35, and a Josh Boyce RC Black PP. Sick!